The golf course is scheduled to reopen for the 2019 season on May 16th (book your tee time now!). 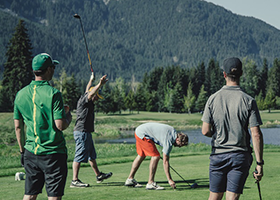 Sign up for THE INSIDER Nicklaus North eNews! Snowcapped Whistler peaks. A brilliant emerald-coloured lake. Majestic fir trees. Fresh, invigorating mountain air. Whistler Golf at its Finest. This is the setting that inspired the great Jack Nicklaus to create a golf course as unique as himself. This par 71, 18-hole course winds along a gentle valley floor offering you a spectacular setting as your golfing skills are tested to the fullest. Winner of numerous awards since its opening in 1996, Nicklaus North has played host to events such as the Skins Game and the Shell's Wonderful World of Golf, welcoming some of golf's biggest names such as Jack Nicklaus, Nick Faldo, Ernie Els, Greg Norman, Fred Couples, John Daly, Vijay Singh and Stephen Ames to name a few. Just minutes from the resort village of Whistler, British Columbia, Nicklaus North stands out as one of the great courses in North America. It's no wonder this is only one of a few rare golf courses in the world bearing Jack Nicklaus' name.